The main dish casserole is usually a one-pot meal―an easy and convenient way to prepare a family meal. Casseroles came to popularity in the 1950s when casserole dishes were first available to home cooks. Casseroles are often made with a binder―usually a thickened sauce or condensed soup―to hold the ingredients together. While a topping isn't essential, it can add a nice crunchy texture to a dish. Shredded cheese, toasted nuts, French fried onions, buttered bread crumbs, or cracker crumbs are a few popular topping choices. If you're looking for an easy oven-baked casserole, you can't go wrong with one of these popular recipes! 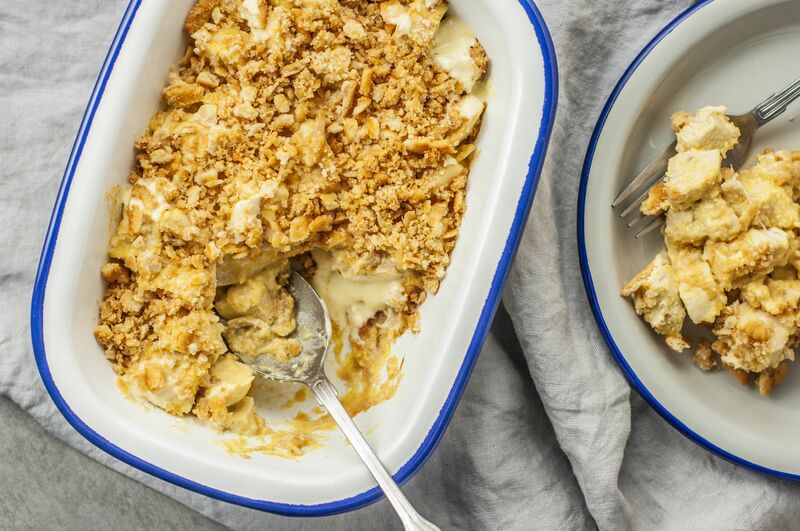 Buttered Ritz cracker crumbs top this delicious ritzy chicken casserole. Save time with a rotisserie chicken or packaged roasted chicken strips. The fact that the casserole contains only six ingredients makes it even more appealing! Tex-Mex flavors abound in this fabulous burrito casserole! It's made with layers of seasoned ground beef and refried beans, cheese, and tortillas. To make dinnertime even easier, cook ground meat in advance and store it in the freezer for whenever you need it for a recipe. This macaroni and cheese dish is not only rich and creamy—it is also quick and easy! The Instant Pot pressure cooker makes mac and cheese in just a few minutes. Feel free to top it with some buttered breadcrumbs and pop it under the broiler for a minute or two. Ham and peas team up in this creamy spaghetti bake. Parmesan cheese tops this easy casserole. top 18 leftover ham recipes to provide some inspiration! This classic shepherd's pie is almost entirely cooked in the Instant Pot, which makes it incredibly quick and easy. Pop it under the broiler for a minute to brown the mashed potato topping. Who doesn't love a comforting macaroni and cheese bake? This creamy version will please everyone in the family. Have you run out of ideas for that leftover corned beef? Here's a 5-ingredient corned beef and cabbage casserole. Throw it together, pop it in the oven, and enjoy your free time. A delicious ground beef and Italian sausage sauce, ricotta cheese, and cooked ziti pasta make up this fabulous cheese-topped casserole. A simple recipe for homemade biscuits makes a fabulous topping for this chicken pot pie. The biscuit dough is patted out and then cut into squares. There's no rolling (or re-rolling) required! This cube steak casserole is a fine example of what you can do with budget-friendly cuts of beef. 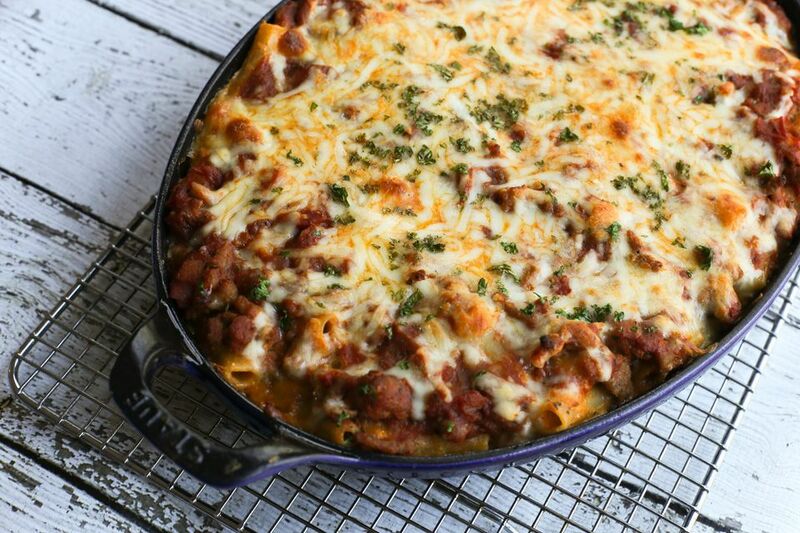 If you're craving pizza, but don't want to make a crust, try this hearty pasta casserole. The combination of pizza sauce, ground beef, pepperoni, and your favorite toppings makes this dish a meal even the pickiest family members will enjoy. This hot dish of unstuffed peppers casserole is a great way to enjoy the flavors of stuffed peppers. Use a combination of colorful bell peppers, rice, ground beef, and tomatoes and you are set for the evening! This classic tuna casserole is always a family favorite. This familiar version contains noodles, condensed soup, peas, and cheese. The browned breadcrumb topping adds crunch and texture. You might not think of shrimp for a casserole, but this one will change your mind. Garlic and minced shallots flavor the rice mixture in this easy dish. A basic medium white sauce brings this turkey and noodle casserole together. The dish bakes to golden perfection with a shredded cheddar cheese topping. It can be made with chicken as well, if that's what you have on hand (or prefer). This crock pot potato and ham casserole recipe is made with ham, potatoes, onion, cheddar cheese and condensed soup. It's a very easy preparation. Just slice the potatoes and onions and layer everything in the slow cooker. Mix the soups and milk together and pour over the casserole. Use your leftover roast beef and mashed potatoes to make this budget-friendly cottage pie. This chicken and noodle casserole is a one-dish meal with chicken a la king flavors. The dish comes together with a creamy homemade sauce, celery, and pimientos. Yum! If you have leftover roasted pork, use it to make this tasty pork and noodle bake. Serve this one-dish meal with a tossed salad and crusty French bread. Here's yet another excellent pasta bake with ground beef. You'll make this spaghetti casserole again and again. Mozzarella and Parmesan cheeses top it off. This spaghetti pie is a similar preparation. A potato chip topping adds crunchy flavor to this easy chicken casserole with potato chip topping. It's similar to a hot chicken salad, made with mayonnaise, sour cream, and condensed soup sauce. This is a great way to use leftover ham, and it's a delicious combination of flavors. The cheddar cheese sauce is mixed with cooked penne, diced ham, peas, and seasonings to make a tasty casserole, baked to perfection with a buttery crumb topping. Serve this flavorful penne bake with a tossed salad for a complete and satisfying meal. A cheesy biscuit topping gussies up this casserole of beans and hot dogs. The baked beans get great flavor from barbecue sauce and some chopped vegetables along with mustard and brown sugar. Sliced hot dogs make these doctored beans a hearty one-dish meal. Here's another casserole that gets a helping hand from a convenience food. Crescent roll dough forms the crust for this easy ground beef stroganoff bake. Crushed Dorito chips form the crust and topping for this easy chicken casserole. The chicken teams up with condensed cream of chicken soup and sour cream. The cheese topping finishes the dish perfectly. You can even use a can of tomatoes with green chili peppers (e.g., Ro-Tel) to spice things up! Serve this easy one-dish, Tex-Mex beef and biscuit casserole with a tossed green salad or sliced fresh tomatoes and cucumbers for a tasty family dinner. Layers of tortilla chips, cheese, beef, beans, taco sauce, and salsa make this a satisfying all-in-one main dish. Taco seasoning gives the ground beef Tex-Mex flavor for this beefy nacho casserole. This pork chop and rice casserole​ recipe is an easy baked one-dish meal your family will love. The pork chops are browned and then combined with the vegetables and the easy gravy sauce mixture over the rice. Add some steamed vegetables or spinach to the rice before baking for extra color and flavor. Chicken and dressing casserole brings the flavor of Thanksgiving to a Tuesday night family dinner, without hours of prep and cooking. Just combine the ingredients and pop it in the oven to bake. The cheese topping adds crunchy appeal, but you can easily omit it. This tasty beef enchilada casserole will surely become a family favorite. With browned ground beef, chili peppers, tortilla chips, and cheese, this is an excellent casserole to bake for a family meal. Tuna and spaghetti team up with mushrooms and Parmesan cheese in this tuna tetrazzini recipe. It's a whole meal in one pot and can be prepared a day in advance, making it a convenient and tasty dish for a busy day. Chicken stock and milk team up to make a light sauce for this chicken and noodle bake. Southwestern seasonings make this a flavorful Southwestern-style beef and potato bake a dish the whole family will enjoy. Prepare the casserole earlier in the day and refrigerate until it's time to bake. If you're looking for a way to use leftovers, this ham and rotini casserole just might be your solution. Cheese and leftover ham team up to create a one-dish comfort food that we're sure your family will enjoy! This turkey quiche with peppers is an inventive and delicious way to use that leftover turkey. And the fact that it's made without a pie crust makes it a super easy preparation. The quiche can also be made with ham or a combination of ham and turkey. Or add some crumbled cooked bacon for smoky flavor. This scalloped oyster dish with cracker crumbs is not only easy; it's elegant enough for a special occasion. Serve this oyster bake with baked potatoes or rice and a green vegetable. Serve this tasty ground beef and cabbage casserole with mashed potatoes or rice if you'd like a starch. For a low-carb option, serve it with a simple tossed salad or slaw. This potato and sausage hotpot is a Southernized version of the comforting British Lancashire hotpot. Cajun andouille sausage flavors the dish. Browned sausage and sliced tomatoes help to make this creamy, delicious macaroni and cheese a hearty main dish. The flavorful casserole is made with pork sausage, chopped vegetables, and a homemade cheese sauce. It's topped with a buttered bread crumb topping and baked to perfection. This Southern-style chicken casserole starts with a cut-up chicken, but leftover chicken or turkey or the meat from a plump rotisserie chicken are excellent alternatives. Vegetables include corn and green beans. Browned fresh sausage and rice team up in this tasty casserole along with peppers, onions, and toasted slivered almonds. Cauliflower takes the place of rice in this tasty chicken casserole. The one-pot dish makes the perfect meal for anyone watching their carbs. A little cream, some cheddar cheese, and a variety of herbs jazz the casserole up and give it great flavor. Feel free to make this easy chicken and penne casserole with macaroni or a similar pasta. It's a simple preparation with frozen mixed vegetables, condensed soup, sour cream, and Parmesan cheese. This easy chicken and broccoli casserole is a snap to prepare and bake. Serve this dish with a tossed salad or fresh sliced tomatoes. This easy Tex-Mex chili nacho casserole is a well-spiced combination of ground beef, chopped vegetables, cheese, tomatoes, and pinto beans. Tortilla chips are layered with the ground beef mixture. If you like heat, use pepper jack cheese and add some finely chopped jalapeño or serrano peppers to the beef mixture. Or add some cayenne pepper. This tasty, popular chicken enchilada casserole recipe is made with sour cream, diced chicken, mushrooms, peppers, tortillas, cheese, and seasonings. Start this casserole about 1 hour before serving time. The enchiladas are baked on a layer of sour cream and topped shredded cheese. This flavorful tater tot casserole is easy to prepare and cook in the slow cooker or in the oven. Use frozen mixed vegetables or a blend of peas and carrots, and sauté 1 cup of chopped onion with the ground beef if you like. Quick made-from-scratch biscuits make up the topping for this homemade chicken and biscuits casserole. Feel free to use ready-made frozen or refrigerated biscuits in this recipe. Sliced andouille sausage, bell peppers, and some spicy Creole or Cajun seasoning give this spicy sausage and penne casserole its Louisiana flavor.